There was a time in Primary School when, bored with just being an Aussie, I pretended to myself and sometimes to my classmates that I was Scottish. Well, I guess I am partly, being descended via my mother from Scottish people named Christison, voluntary boat-people from the latter 19th century. The tartan, by the way, actually came from Scotland via my Aunt Beth who visited there a number of times. It must be around 40 years old now but is still my main source of winter warmth! Highly efficient. They’ve been around in Scotland for a while, the Christisons. On the right you can see a heap of them, including my great-great-grandfather, in the town of Brechin in Angus-shire in the 19th century. And I recently discovered one – probably one of them – was deep in the Scottish Reformation. After Parliament was over, at the end of December 1558, the Archbishop of St. Andrews again summoned the preachers, Willock, Douglas, Harlaw, Methuen, and Friar John Christison to a “day of law” at St. Andrews, on February 2, 1559. (This is the statement of the “Historie.”) The brethren then “caused inform the Queen Mother that the said preachers would appear with such multitude of men professing their doctrine, as was never seen before in such like cases in this country,” and kept their promise. The system of overawing justice by such gatherings was usual, as we have already seen; Knox, Bothwell, Lethington, and the Lord James Stewart all profited by the practice on various occasions. Dabbling in family history of the Christisons — my mother’s lot. Sasine (Scots law) is the delivery of feudal property, typically land. Alexander Setoune [Seaton] of Tulybody [Tullibody], sheriff of Strivelineshire [Stirling], in favour of John Davidsone [Davidson], one of serjeants of said sheriffdom. Description Notary: Dugald Cossour [Cossar], priest, St. Andrews diocese. Attorney: Thomas Buchquhanane [Buchanan]. Witnesses: Robert Buchquhannane [Buchanan], Patrick Haldane, Thomas Cristisone [Christison], David Lyndesay [Lindsay], John Conysoune, Duncan Arrald [Arrol], MAURICE MAKADAME [McAdam], Patrick Malcomsoun [Malcolmson], Gilchrist Henrisone [Henderson]. Lately I have been reading quite a few Scottish things, beginning with Josephine Tey. More about her in the next post, except to say she was no fan of Scottish Nationalists. Here is her portrait of one from her novel The Singing Sands. … They fished turn-about, in a fine male amity; Grant flicking his line with a lazy indifference, Pat with the incurable optimism of his kind. By noon they had drifted back to a point level with the little jetty, and they turned inshore to make tea on the primus in the little bothy. As Grant was paddling the last few yards he saw Pat’s eye fixed on something along the shore, and turned to see what occasioned such marked distaste. Having looked at the advancing figure with its shoggly body and inappropriate magnificence, he asked who that might be. ‘That’s Wee Archie,’ said Pat. Wee Archie was wielding a shepherd’s crook that, as Tommy remarked later, no shepherd would be found dead with, and he was wearing a kilt that no Highlander would dream of being found alive in. The crook stood nearly two feet above his head; and the kilt hung down at the back from his non-existent hips like a draggled petticoat. But it was obvious that the wearer was conscious of no lack. The tartan of his sad little skirt screamed like a peacock, raucous and alien against the moor. His small dark eel’s head was crowned by a pale blue Balmoral with a diced band, the bonnet being pulled down sideways at such a dashing angle that the slack covered his right ear. On the upper side a large piece of vegetation sprouted from the crest on the band. The socks on the hairpin legs were a brilliant blue, and so hairy in texture that they gave the effect of some unfortunate growth. Round the meagre ankles the thongs of the brogues were cross-gartered with a verve that even Malvolio had never achieved. ‘What is he doing round here?’ Grant asked, fascinated. You will find her books linked to the picture. See also Elizabeth Mackintosh: woman of mystery who deserves to be rediscovered. Last week, I went to Kevin Spacey’s Richard III at the Old Vic and came away marvelling, yet again, at the polemical and psychological brilliance of Shakespeare’s remorseless Tudor propaganda. The "bottled spider" is not just a deformed monster, an object of fear, but a strangely lovable monster, who excites our pity, too. Afterwards, the conversation turned to the princes in the Tower. Did Richard really murder his nephews? The Daughter of Time was one of my adolescent favourites and so I referred, en passant, to Josephine Tey. Blank looks: no one had heard of this once-celebrated mystery writer from the 1940s and 50s. That might be how Elizabeth Mackintosh, born in 1896 at Inverness, might have wished it. As well as "Josephine Tey", she also wrote as "Gordon Daviot", and seems to have been obsessively private. Even in death, she slipped away, unobserved, and in disguise. The Timesrecords the death of Gordon Daviot on 13 February 1952, two days before the state funeral of George VI, whose life, death and majesty had filled the newspapers that week. Miss Mackintosh’s cremation in Streatham Vale was attended by only a handful of mourners, but they included Dame Edith Evans and John Gielgud, both friends. So, whoever "Gordon Daviot" represented, it was someone rather unusual, a creative artist whom people cared about. Gielgud later wrote: "Her sudden death was a great surprise and shock to all her friends in London. I learned afterwards that she had known herself to be mortally ill for nearly a year, and had resolutely avoided seeing anyone she knew." 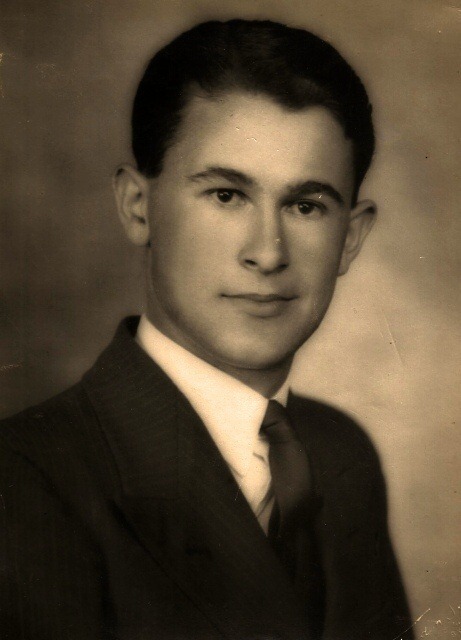 Just thinking: when my Uncle Neil participated in the landing at Aitape in April 1944 he was still only 19 years old! He had just turned 19 when I was born and named after him – three days after his birthday. I really do begin to see why I was so named. The family wouldn’t have known exactly where he was, but they sure would have known he was in harm’s way, more than anyone else in the family at that time. Next door on the northern side of 61 Auburn Street were the Saunders family. In the late 40s and early 50s my brother’s horse was kept in their backyard. As I said in an earlier post. I do remember sitting on my dinkie on the gravel drive, near the Dorothy Perkins climbing rose which I called Mrs Perkins and confused with the lady next door [Pat Saunders] who I thought was also Mrs Perkins. A yellow biplane flew over very low and the pilot leaned out and waved to me. My mother later told me that must have been the end of World War II. There was some kind of tragedy about the Saunders’s. Not to put too fine a point on it, Harry was a soak. But the reasons were hush-hush, not that I at ages three to eight would have shared in or even understood such things. But I do note that his war service was cut short. Born in 1904, Harry had enlisted in November 1939 and was a Sapper in the 6th Division Engineers. However, he was discharged on 8 January 1940, before the 6th Division left Australia. The 6th Division was the first division formed for the Second AIF in the Second World War. It was so designated because there were already five divisions in the Australian Military Forces when the decision was made in September 1939 to raise a ‘special force’ for overseas service. The division was originally composed of the 16th, 17th and 18th Brigades, but the diversion of the 18th Brigade to the United Kingdom in June 1940, meant that the 19th became its third infantry brigade. Between early 1942 and late 1943 the composition of the 6th Division varied considerably due to the changing operational situation. During this time the 14th, 21st, 25th and 30th Brigades also came under the division’s command for varying periods. As a formation, the 6th Division fought in the campaigns in Libya, Greece, and the Aitape-Wewak region of New Guinea. Its individual brigades also fought on Crete, in Lebanon, along the Kokoda Trail and at the Japanese beachheads in Papua, and in the Wau-Salamaua region of New Guinea. It was commanded, in succession by Major Generals Thomas Blamey (13 October 1939 – 3 April 1940), Iven Mackay (4 April 1940 – 13 August 1941), Edmund Herring (14 August 1941 – 30 April 1942), George Vasey (14 September 1942 – 14 March 1943), Jack Stevens (15 March 1943 – 26 July 1945), and Horace Robertson (26 July 1945 – 30 November 1945). So who knows what happened to him. I also have this (false?) memory that Pat Saunders was Canadian and eventually returned to Canada, but I could be wrong about that. But I do recall when Harry died. Or words very close to that. My mother often told that story with a smile. I should add she seems to have had a lot of time for Pat Saunders and felt, I suspect, sorry for her and not just for the recent bereavement. The RIP indicates Harry was a Catholic, and most people in the street were not. That may seem an odd thing to say but such things still counted in the 1940s and early 50s. 1955: Uncle Neil and Aunt Fay on the left, a friend of theirs, me. Easter, as I recall, so I would have been 11 then. Nine years before I see Uncle Neil was after a new car. He must have still been living with us in Auburn Street then. That and the car-related ads I posted yesterday serve to remind us of one immediate post-war phenomenon – demand for and apparently shortage of cars. Hence, no doubt, the Holden. Neil was then just shy of his 22nd birthday and not long back from a very nasty war. Now that one, it seems to me, is 1944-45, but very likely 1945 in the back yard of 61 Auburn Street. In the left panel my Aunt Ruth Christison, mother of Ray who now and again comments here. I am in front of her, no older than 2 years which was 1945. The centre panel has my mother Jean, my Uncle Neil Christison, on leave no doubt from the RAAF at the time, and my sister Jeanette (1940-1952). I am named after Uncle Neil, who is still with us. On the right my Aunt Beth Christison, later Beth Heard, and my brother Ian. That’s my brother Ian going to school. The photo is in Auburn Street Sutherland – yes, a dirt road then. The house is the McNamara place, opposite ours. Roy Mac had a slit trench air-raid shelter. If the point of this pic is my brother’s first day in “big school” then it would be around 1941, but it is certainly no later than 1944. See the fence to the right? That was the Elliott place. Uncle Neil rarely talked about it, so I was chuffed a while back to see that piece he had written recently – quoted above. My mother told me a bit about it, especially that as a signaller, as Neil says above, he was “always first” of the “always first.” The book of that title by David Wilson (1998) is available free as a PDF file. Wilson describes the landing at Aitape. Ranges, five to twelve miles inland. Along the beachfront the invaders could see the Japanese cooking fires. It was a tranquil tropical scene soon to be turned to bedlam. Alan Robson recalls that he ‘couldn’t imagine that [the naval bombardment and the air strikes] could [create] that much noise. It was deafening … you could see the coconut trees being flattened … The fighters came in and strafed … you could see the tracer bullets … and then the big bombers came over and you could see the bombs dropping’. The 163rd Regimental Combat Team landed at the village of Lemieng at 0645, killing several Japanese soldiers and taking 50 Javanese labourers prisoner. The fourth wave included Wing Commander Dale, Squadron Leader Jamieson and 18 members of 13 Survey and Design Unit who landed at 7 am to undertake a reconnaissance of the area. In all 50 RAAF Works personnel landed." The troops had landed at the village of Wapil, about three quarters of a mile from the planned site of Koroko, causing minor confusion. RAAF equipment had to be parked on the beach until the opportunity offered to move it to Koroko and unloading was hampered by heavy rain. It was not until midday that the northern ai~strip was captured and the surveyors could peg out the runway so that the construction of the fighter strip could commence. This very much resonates with things my mother told me. How do I know? Well, thanks to The National Library of Australia’s Trove. But I think our car was black or brown… I should also add that for some reason I have remembered the phone number of 61 Auburn Street: LB 2271. In the 1940s it was one of the few telephones in the immediate neighbourhood. The street was a dirt road, washing away into great ruts when it rained heavily enough. Sutherland was still in touch with its semi-rural past then. The site of Gymea High School was still a dairy farm. Old Fred [Vallance] two doors down kept a cow, his backyard extending into a sizeable paddock. In his cowshed he had a gas mask from the war. It fascinated me. The cow terrified me, though its milk sustained me during the war and the period of shortages immediately after. In their backyard the Doyles had a goat. Not the only cow either. 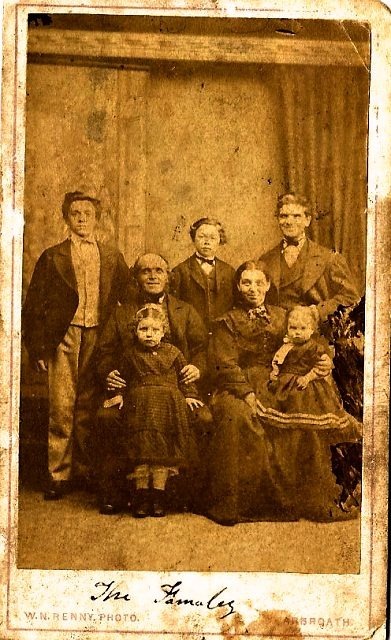 Their great-grandson – or great-great-grandson? — is now Headmaster at Sydney Grammar School. Now what was its name…? Thanks Neil, The links are great and the other photographs from Auburn St are really evocative–we’ve been telling our kids about it and explaining how this is a little bit of history right here! I did notice a house name plaque in one of your photos (and can see on our wall where it use to be). Any chance you recall the name of the house? Houses used to have names quite commonly, as in this case in East Redfern/Moore Park. And it appears my first home, 61 Auburn Street Sutherland, did have a name, but I can’t recall it and neither can my older brother. The mystery name plate – my Uncle Eric and his son John there, before 1943. When I can get hold of my one surviving uncle, Neil – after whom I am named – I will see if he remembers. My Uncle Neil in the backyard of 61 Auburn Street. 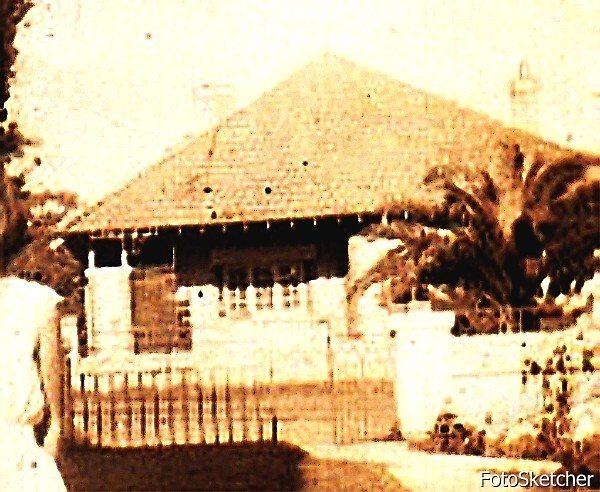 That yard went half-way to Acacia Road, Kirrawee, then. The house has long lost the land it then stood on. My brother Ian. That has to be the earlier 1940s, before I was born. Ian again on the front veranda of 61 Auburn Street. All of us and a cousin, with Ian lurking in the background and me next to my sister and cousin, Mum leaning over my cousin. A rather ghostly image of 61 Auburn Street on 21 March, 1949. Digging on Trove I have however found some new things, of which next entry! Coming up is the anniversary of the fall of Singapore in 1942. I don’t recall that but it certainly affected some people I have known very directly and all of my generation in one way or another. Of course less well known is the fact that I was conceived in 1942. Then there is 1952 and the current Diamond Jubilee of the accession of Queen Elizabeth II to the throne. That one I remember very clearly for reasons I gave last month. By a very indirect route that brings me to my grandfather, Roy Christison. That’s him seated on the right of that photo with my brother Ian leaning against him. You see of the many things Grandpa Christison talked about with me during the 1950s – and oh how significant I now know those conversations to have been in my life and thought! – one topic was the Diamond Jubilee of Queen Victoria, which he, to my astonishment, remembered – along with much else of pre-Federation New South Wales. And another thing that peppered conversations with Grandpa Christison was Charles Dickens. Grandpa Christison’s world-view owed more to Charles Dickens than it did to the Bible – about which he had somewhat agnostic views. He used to say that if you saw someone praying you needed to watch out for the knife behind his back, for example. But Dickens – no friend either of evangelicals and God-botherers – was a pure source of ethics as well as delight. My mother recalled family readings of Dickens, as no doubt many people of my grandfather’s time and tribe would. And of course it is now the Dickens Bicentennial. FOR someone who never visited the place, Charles Dickens wrote, obsessed, lobbied and published an awful lot about Australia. At first, Dickens saw Australia only as a place of transportation, says a Queensland scholar, Marion Diamond,on her website Historians are Past Caring. Like Magwitch and Micawber, the Dickens boys prospered in the new land of opportunity. At least, at first. Alfred bought a station near Forbes, NSW, and later moved to Victoria, where he and his brother set up a stock and station agency, called EBL Dickens and Partners. He died on a visit to the US. Edward managed a property in Wilcannia, and for five years represented the town in state Parliament. He later worked as a rabbit inspector and lands department officer for the NSW government. He died in poverty in Moree. In Australia as in England, the public devoured Dickens’s prolific outpourings in books, stage plays and magazines, such as Household Words and All the Year Round. As the author’s entry in the Australian Dictionary of Biography notes, so widely published was his material that it ”helped impose Dickens’s own view of Australia on Australian life and society”. Marie Bashir, the NSW Governor, is one of many prominent admirers of the author, who died in 1870. She recently recalled how as a ”little book worm” growing up in Narrandera in southern NSW, she visited his statue in the park, and later munched her way avidly through his complete works. Next entry I will recall another anniversary of a literary nature, and confess more about my new addiction to eBooks! Thanks to Ray Hampton Christison. See South African War and my family….